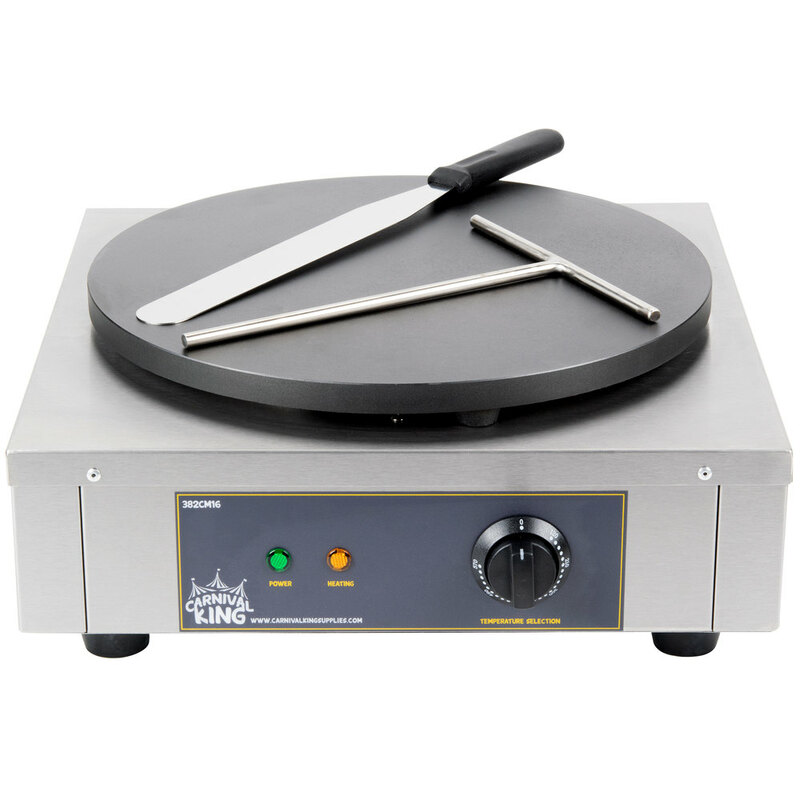 Serve up deliciously sweet crepes topped with your signature sauces and fillings by adding this Carnival King CM16 16" crepe maker to your lineup! This unit includes a metal T-spreader and a spatula to make whipping up a batch of fresh crepes at your restaurant or hotel breakfast bar a breeze. Non-slip feet help add stability to the unit, ensuring that it doesn't slide or scratch your countertop while you're cooking. Plus, this unit has an easy-to-use thermostatic control so that you can set it at the perfect temperature with a simple turn of the knob. The 120 - 570 degree Fahrenheit temperature range allows for maximum versatility from a durable, long-lasting machine. This unit is made of heavy-duty stainless steel to ensure that it is easy to clean and maintain as well as tough and durable enough for long days of use in your cafe. The cooking plate is made of heavy-duty cast iron with a non-stick coating to make sure that your crepes come out perfect and golden without sticking to the plate. Warming and power indicator lights let you know when the unit is on and warming up so that you always know when it is ready to cook.